Midwest City, Oklahoma is a decidedly blue-collar suburb of Oklahoma City with about 54,000 residents, located to the east of downtown and sprawled out roughly along I-40. Over the years its economy has had its ups and downs, but as of recently has sort of been in the toilet aside from the saving grace of Tinker Air Force Base which provides the region’s economic base. General Motors closed its Oklahoma City assembly facility in 2006, and numerous businesses left the area about 20 years ago during the Oklahoma oil bust of 1983, when the economy of the entire region deflated rapidly and dramatically. Though some areas around Oklahoma City have re-emerged successful through the service industry and technology sector, the east side of the metro has fared decidedly worse than the expanding north, west, and south metro areas. One of the major retail corridors of Midwest City is Reno Avenue, which runs directly east from downtown Oklahoma City and further east off into the boonies. 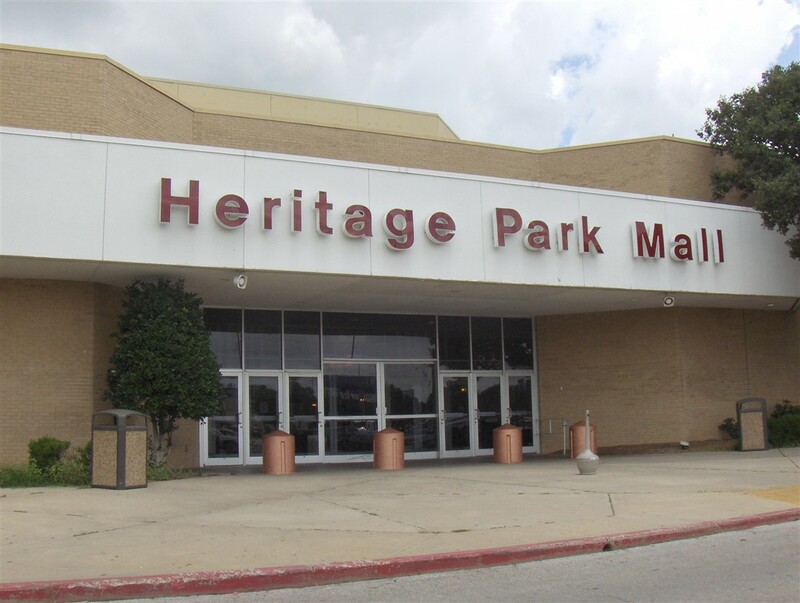 At just over 600,000 square feet, Heritage Park Mall anchors this retail strip in Midwest City, and it opened in the 1970s. I have one source which tells me 1971, and another which says 1978 – which is it? Heritage Park had a fair amount of success in the 1970s and 1980s, as super-regional malls like Quail Springs and Penn Square weren’t as dominant and the local economy wasn’t in dire straits. As the 1990s progressed, Heritage Park started to show its age. 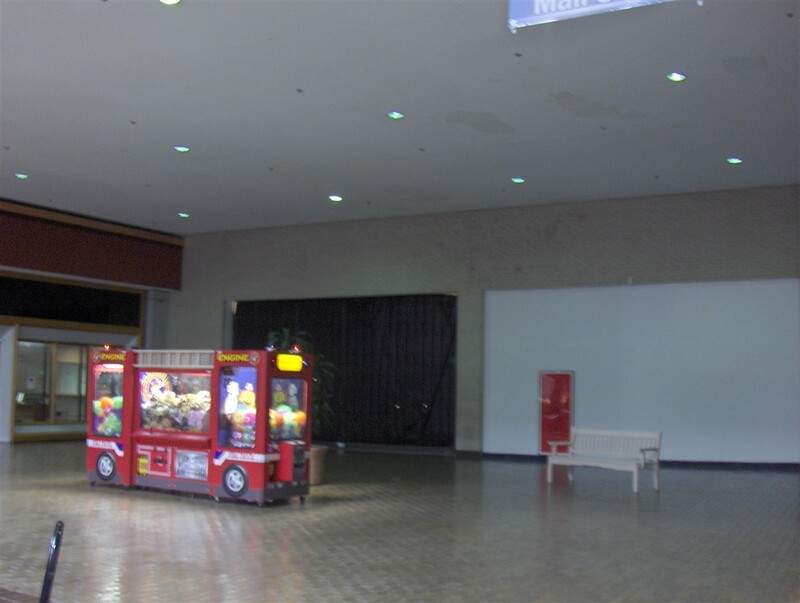 Lacking renovation, stores started to flee the mall in alarming numbers. The rear anchor Wilson’s became replaced by Service Merchandise, and at least the anchor stores were safe for a while. 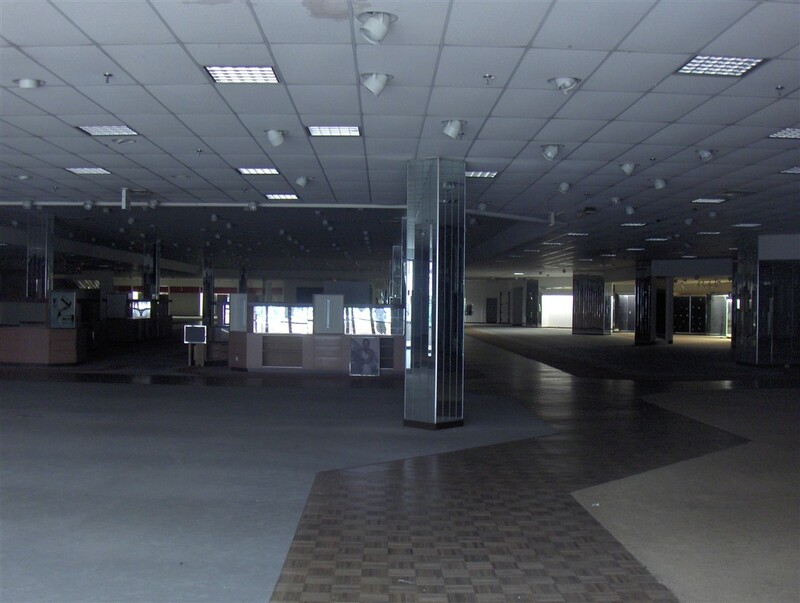 However, the bottom dropped out at the end of the decade when Montgomery Ward left the mall during a round of bankruptcy closures in 1999, and Service Merchandise left in 2000 for the same reason. 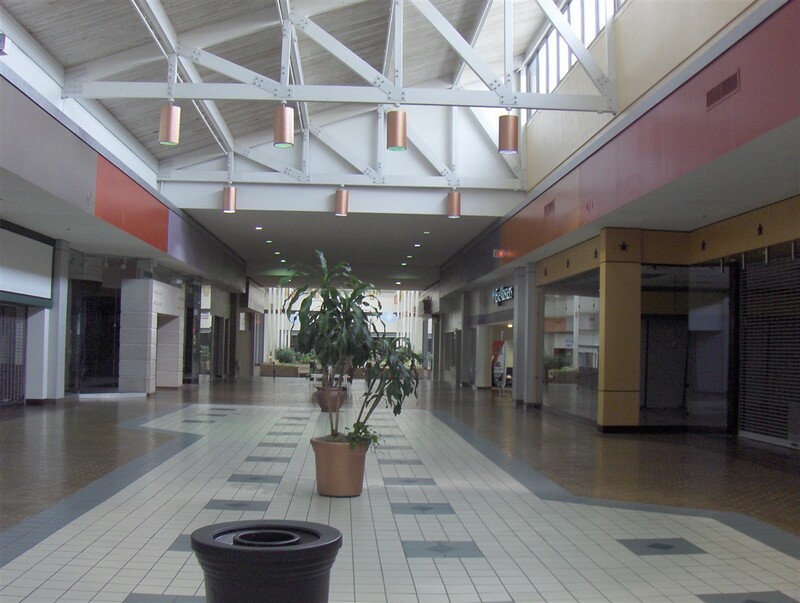 This left 2 gaping anchor holes at the mall, and the 200,000 square feet of inline space began to bleed tenants. 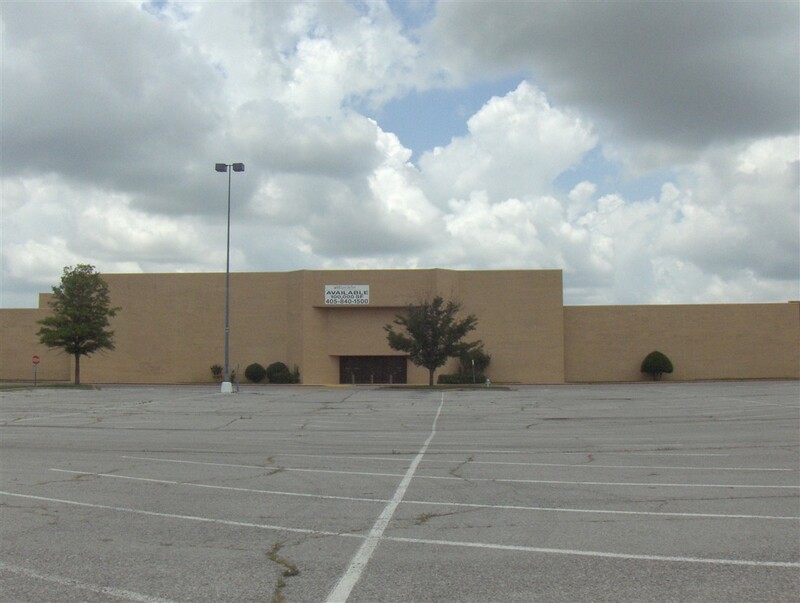 Also in the 1990s, Penn Square Mall on Oklahoma City’s well-to-do north side and Quail Springs Mall in the sprawling far northwest area of the city repositioned themselves as top-tier destination malls, stealing shoppers and therefore tenants from all other OKC-area malls, save for the far-flung ones in Shawnee and Norman. Since 2000, Heritage Park’s fortunes have really gone south. 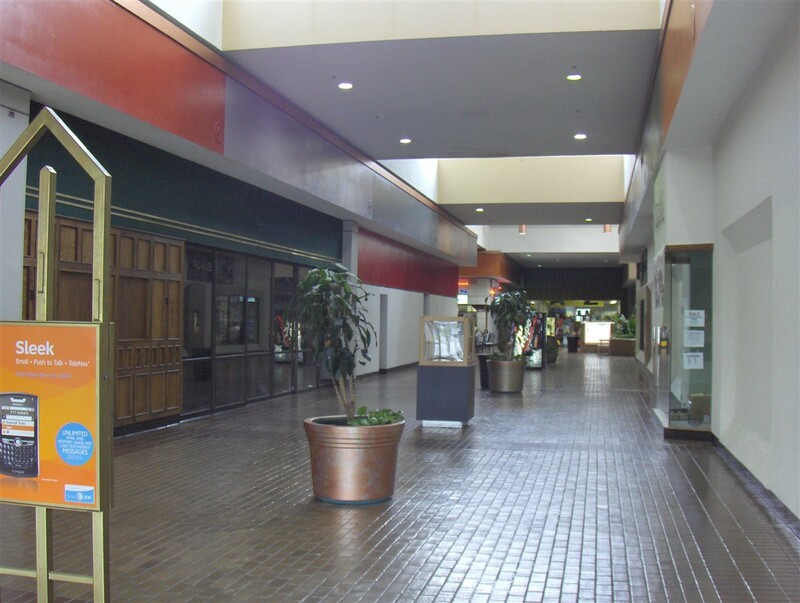 The mall not only has a vacancy problem, but is extremely dated, having not been significantly renovated since the 1970s. Penn Square and Quail Springs continue their dominance in the area, so Heritage Park’s management has had to make one of two decisions. Either redevelop the mall and make a converted effort to reposition, or do absolutely nothing and wait for all the stores to leave. 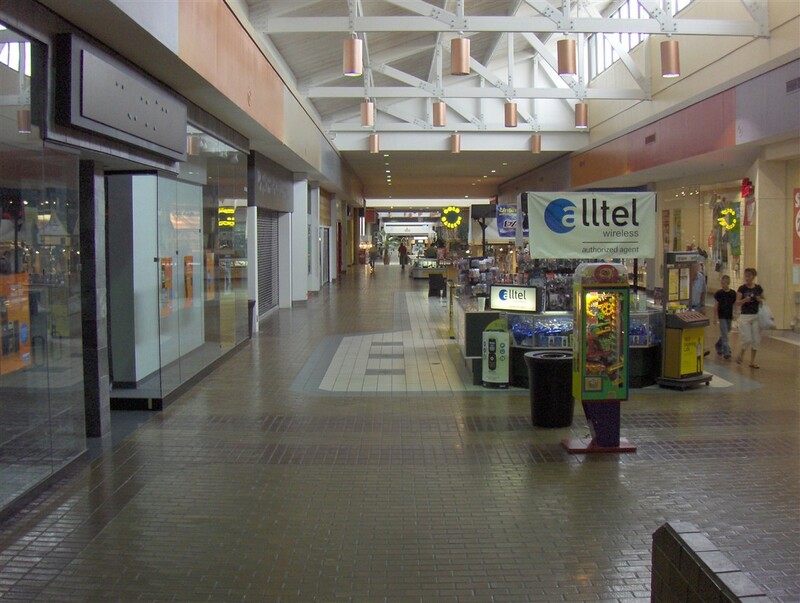 In 2005, mall owners chose the former idea, to redevelop the mall. 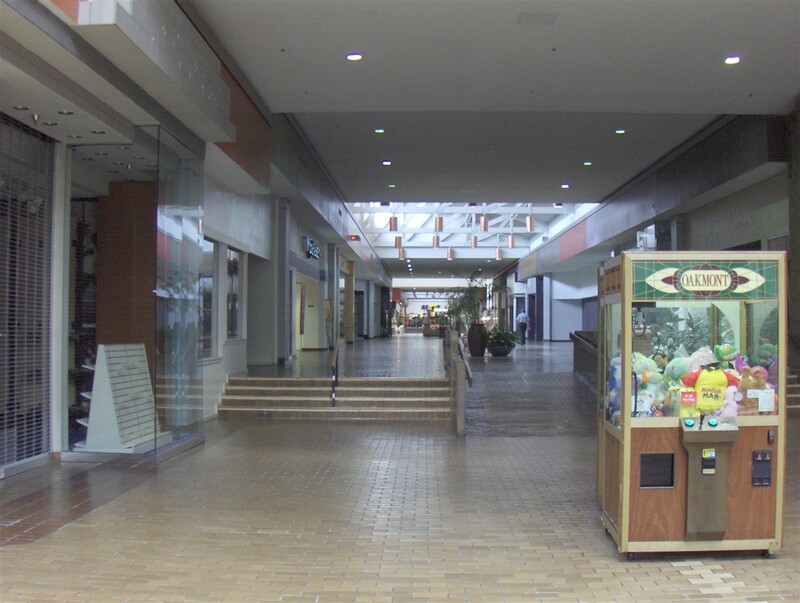 Citing a 33 percent vacancy rate, they determined the best way to redevelop the mall is to position big box anchors along the mall’s frontage (along Reno) and accompany them with in-line stores original to the mall’s configuration. This would significantly lessen the number of “small stores” along the mall’s corridor, but at least it would retain some enclosed space and create a hybridized center of sorts. It could work, if they ever get started. As of June 2007, no work has started on this project. As they’ve waited, Heritage Park continues to bleed stores. In 2006, the Dillard’s location closed, leaving Sears as the lone anchor. 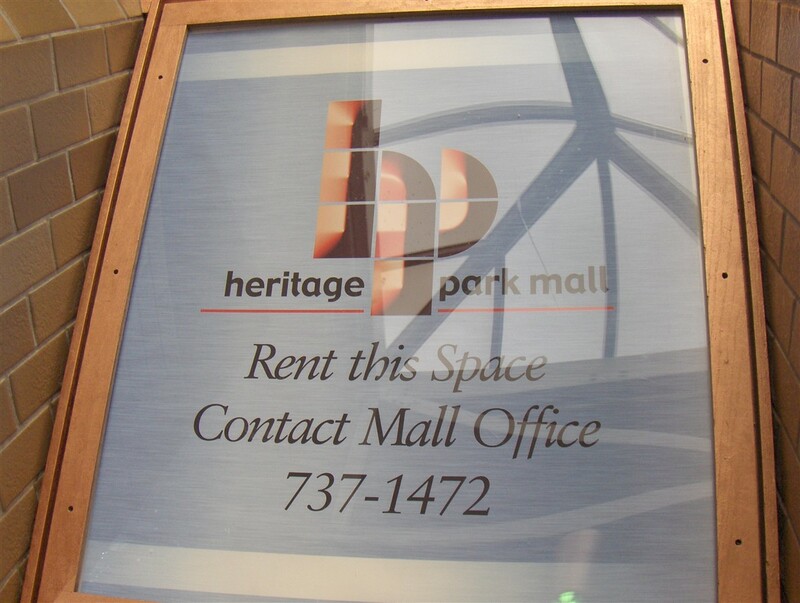 By the end of 2006, Heritage Park Mall was operating at 50 percent occupancy. It won’t be long now.. The pictures featured here were shot in June 2007. As you can see, the decor is amazingly dated, and I would venture to say the mall never received any sort of renovation, at least anything significant. The sunken brick conversation pits, full sized trees, and the dark floor are all reminiscent of the period the mall opened. As for the mall’s design, it’s a relatively simple straight-shot corridor connecting two anchors with the other two behind them, facing the back of the mall. Thus, facing Reno Avenue are several mall entrances which lead directly into the mall’s main corridor. If you have any more information about the mall, such as when it actually opened, or any other anecdotal notes, feel free to leave some comments at any time. The Sunrise Mall in Corpus Christi looks kind of like that. I must say that this place looks similar (to me, at least) to Greenville Mall in Greenville, SC (no longer with us…sigh). It opened around 1978 with a Monkey Ward’s and JB White. 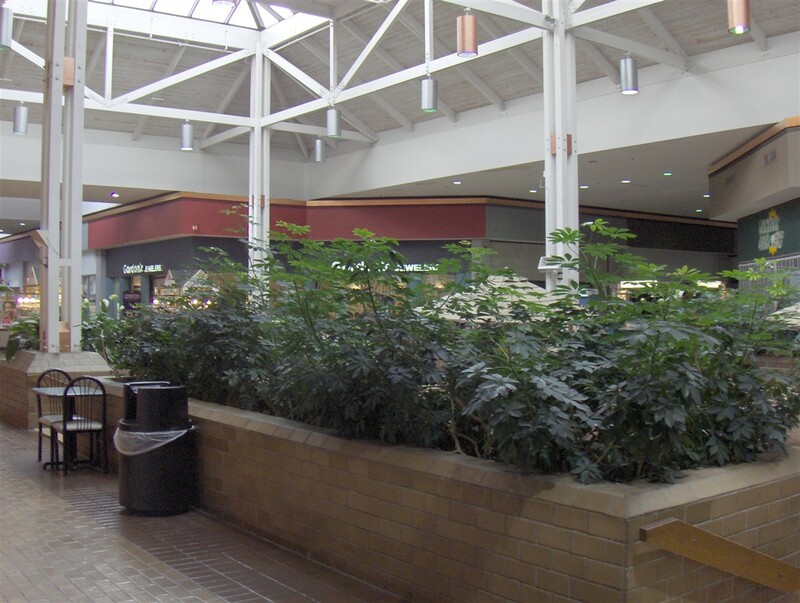 It was your typical dark, brown, 1970s mall. Around 1995 or so, they did a full-blown renovation which included bright white, exposed elements and skylights not unlike Heritage Park’s above. They did, though, put in a nice floor, though. The main difference, though (other than the floor tile), between Gville and HP is that Gville positioned itself a couple of notches more upscale than it used to be, which HP…apparently hasn’t. Oh well…didn’t matter in the end since Ward’s went bankrupt, Dillard’s bought JB White and had 2 stores within 2 miles of each other, and Parisian (added in the 1995 renovation) changed to Proffitt’s and then left altogether. And now we have — you guessed it! A lifestyle center! Anyways…a long, digressing diatribe to say that the interior reminds me of a now-dead mall. Hi, I’m orginalluy from the Del City/ Midwest City area and we use to shop at Hertiage all the time in the late 70s and early 80s. And we usually stopped there o any return visits to OKC. I remember as a kd, there used to be a Circus World Toys (which changed to Kay Bee Toys in 90s and eventually closed around 200, I think). Bought many, many Mego Super hero figures at the Heritage Mall Circus World and Montgomery Wards. The Sears and Chick-Fil-A and that are pictured have been there as long as I can remember. Used to be a theater on the Northwestern side of the mall. 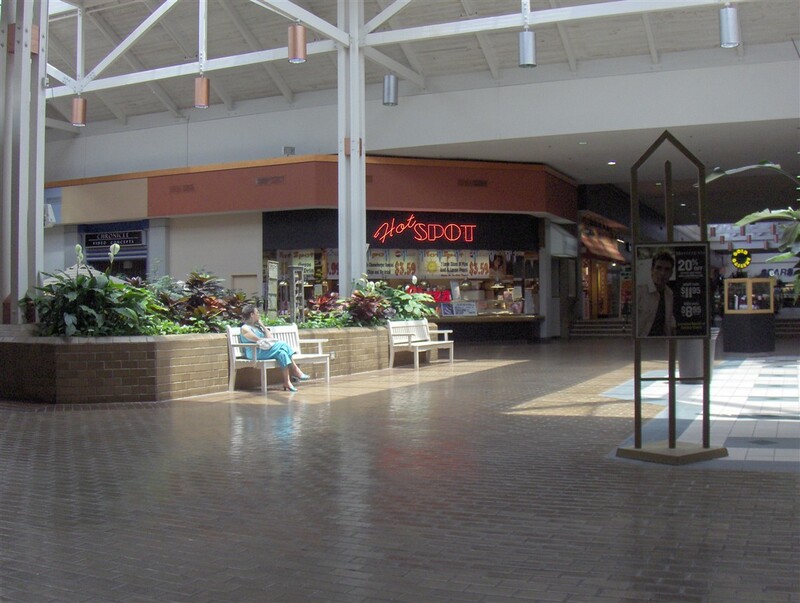 Other typical mall retailers like Spencers Gifts and Walden Books used to be there too. Those photos of the brick seating areas really take me back. Used to play on and around those all the time as a child. Hey now did you change that title photo? It might be slightly different than before, becuase I had to remove all the photos and repost them due to the fact that they were not resized properly and crashing people’s computers. I lived in Shawnee, about 30 miles east of Midwest City from 1976-1991. 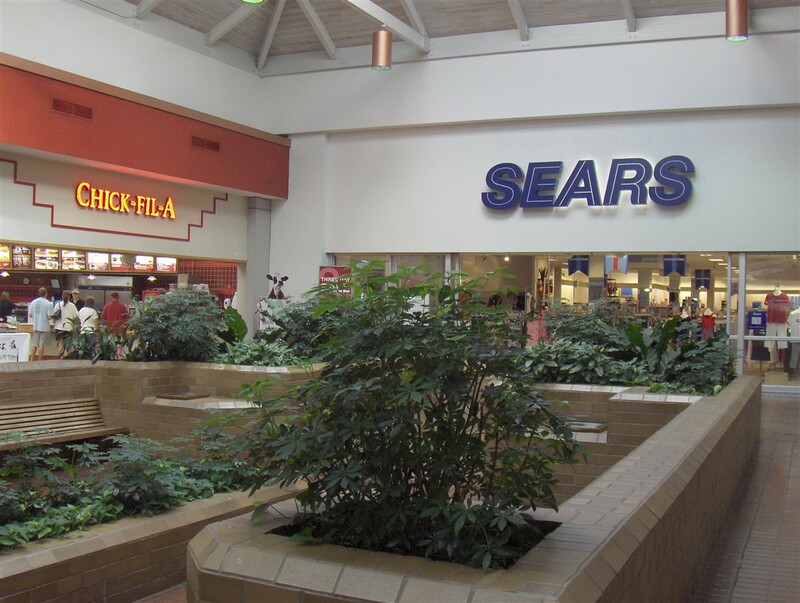 Heritage Park Mall was the closest mall to us until the Shawnee Mall was built in the late 1980s. 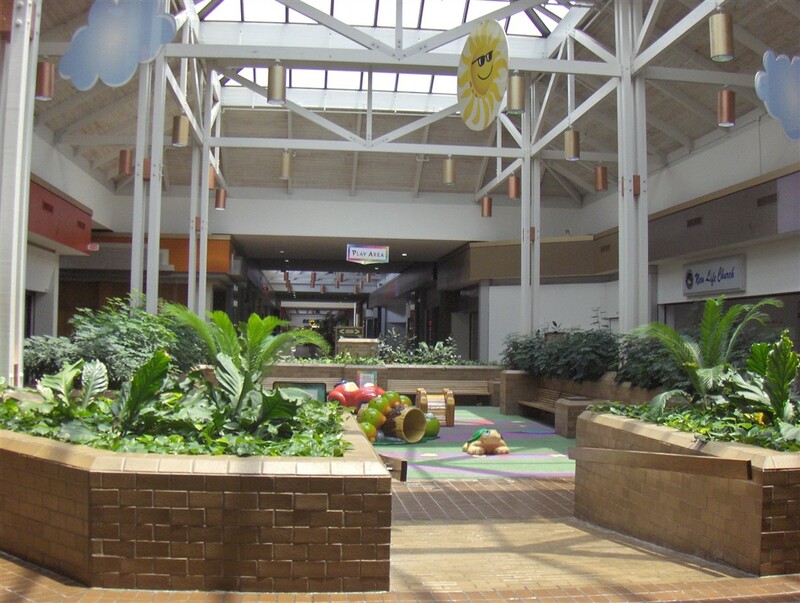 I haven’t lived in Oklahoma for more than 12 years, and seeing an article on Heritage Park Mall brought back some memories. I remember Sears and Dillards. I think the movie theater had only 3 screens. I saw “Red Dawn” and “Gremlins” there. There was another much nicer movie theater, perhaps another mile or two north of the mall on Air Depot. There was an arcade (of course), and I think it was near the pet store. I’m not sure if I’m remembering that correctly. I believe Service Merchandise was on the North side of the mall, and there was some sort of candy store, perhaps located near the arcade. I enjoy this blog very much and appreciate the effort you put into it. I’ve also been to the Mountain View Mall in Ardmore. Calling that place a mall is being far too kind. I currently live in Oklahoma City and I know the area pretty well, although I don’t get down to Midwest City too often. My family has been here since 1999 and up until I read this post, I had NEVER heard of this mall. Clearly, Penn Square and Quail Springs are really the only games in town. However, I can’t see why HP mall wouldn’t be doing better, since the economy here has gotten a lot better since 2002 or so, what with the gas prices helping the oil and gas companies here tremendously. Anyone have a map of the mall? I am a lifelong Midwest City resident. I remember when Heritage Park Mall opened in 1978. I used to like to eat at “The Lion’s Share” restaurant. It is really a shame to see the mall implode like it has. One of the last of the very few places worth patronizing at the mall, in my opinion, Chick-fil-a is moving to a stand alone building that is currently under construction in the “old downtown” redevelopment area on SE 29th St. Unfortunately, I cannot recall the last time that I was in the mall or the reason why I could have conceivably gone there. Hope this helps. The mall actually opened in October 1978. 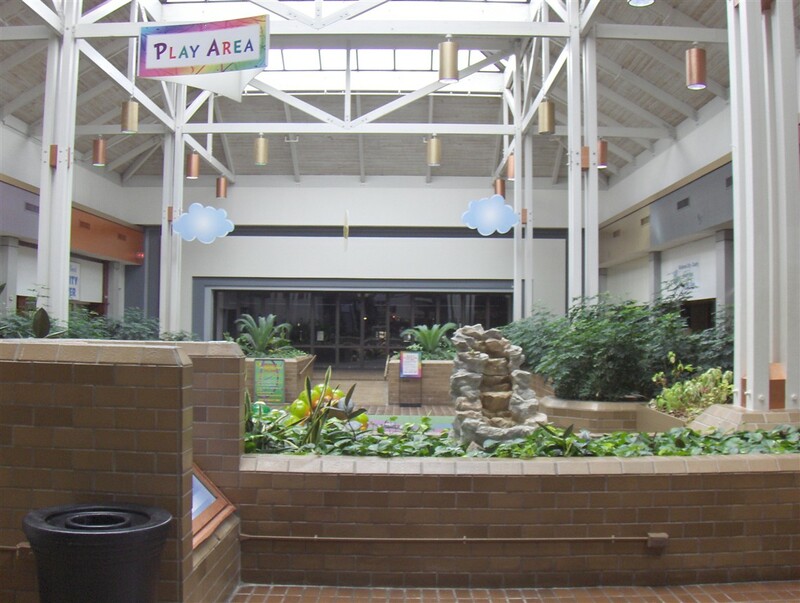 My memories of Heritage Park Mall were the fountain that was centrally located near Zales (used to throw pennies in there when I was a kid), that ice cream place near Montgomery Wards and the pet store (just south of the Hallmark gift shop). Too bad it’s going downhill. I remember there was another cinema (Heritage Park 5) located just north of the mall. I don’t think it helps the mall or any other business in Midwest City either when the City of Midwest City owns the main shopping area, Towne Center. Other small retailers don’t have a chance. Midwest City is my home town and I work at the Atkinson Heritage Center, owned by Rose State College. I have been studying MWC’s interesting history for several years and also teach American history at Rose State. It was actually the mall that killed the original 29th street shopping center after its opening in the late 70s. 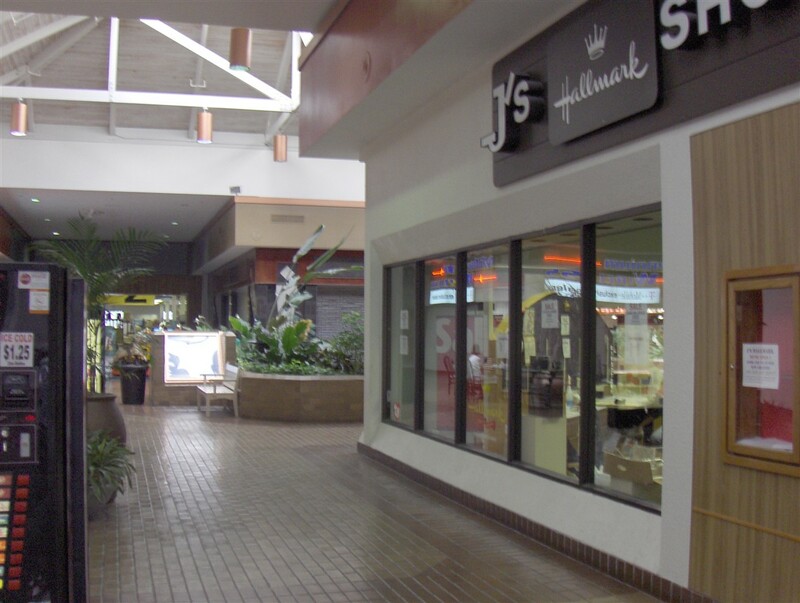 Then JC Penney moved to the new Crossroads Mall, TG&Y closed its store on 29th Street and the rest of the shopping in original downtown tanked. Now, with the City owning Town Center, it is being revived and thriving as it originally did in the 40s, 50s, and 60s. In fact, Penneys closed their Crossroads Mall store and moved back to MWC! The problem with Heritage Park is that it has had and still has multiple owners, for instance, Sears owns its store and the east side parking. 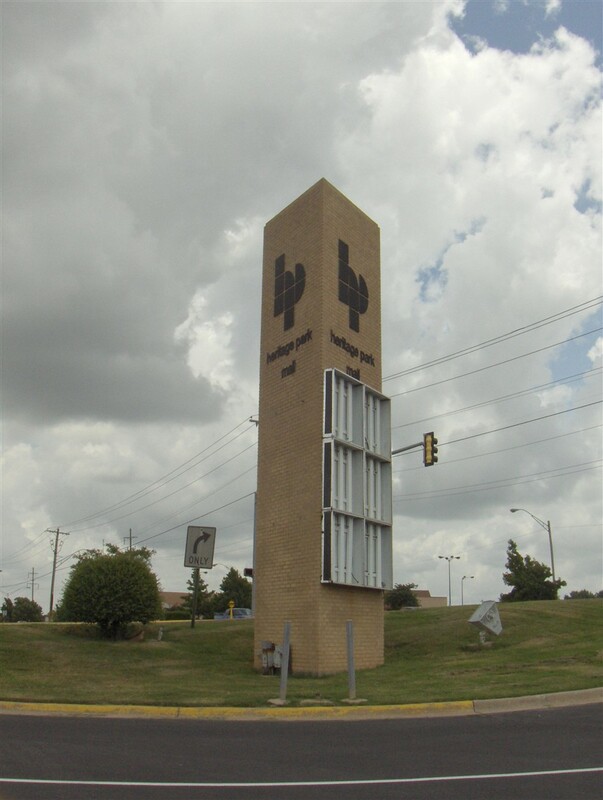 Plus it is not on a main connector to Oklahoma City or communities on the east side, so does not have easy access. I hope it gets revived, or at least converted to something that is useful for the community. Does MWC have a historical society? I’ve been doing some research on the area’s historical geography and I have trouble finding resources.. Check out this website for other historic photos of Midwest City! I was working at Tinker AFB when Heritage Park Mall opened in 1978; like Raymond, I recall eating at the Lion’s Share – and I also remember patronizing Wilson’s. 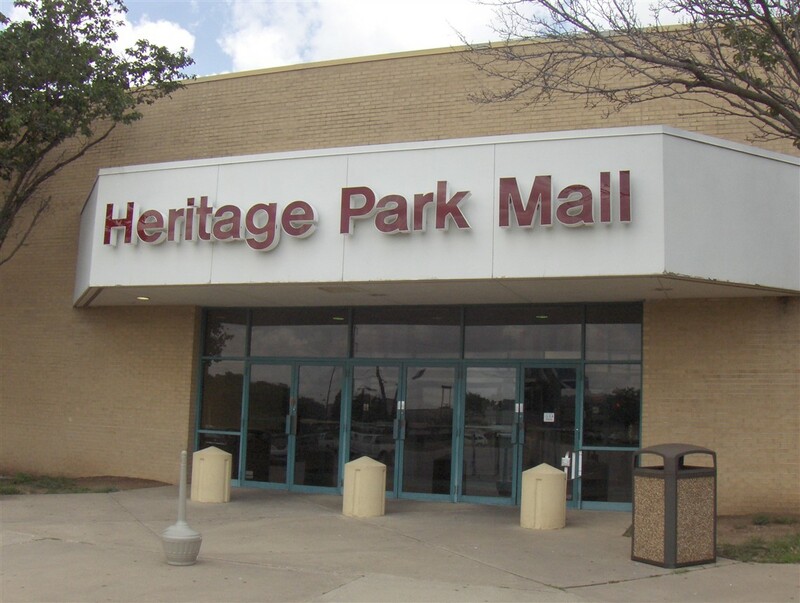 But Heritage Park was never, in my opinion, a particularly dynamic mall from its inception (I shopped elsewhere the vast majority of the time) – and when I left Oklahoma, in 1986, the mall attendance was already declining. I’m so glad to hear I’m not the only one fascinated by these old malls. My friends and I are doing a project, a kind of tribute I suppose, to Crossroads Mall. We’re making a photo essay about it but it may end up being a short film if we can get the resources. We visited Heritage Park for inspiration however I think it’s going to be the whole focus of the movie. We were there at night and I gave us the creeps. There was a cold chill in the air and the mall was so dark, even with all the lights on. By the way, does anybody know why there are so many old cars in one of the old anchor stores on the north side? The current owner of the former Wards building also owns a car repair shop and he stores his old cars in the old Wards Auto Center. on the above comment, i meant to say: IT gave us the creeps. I’m very interested in this mall project you mentioned. Could you contact me with more info? 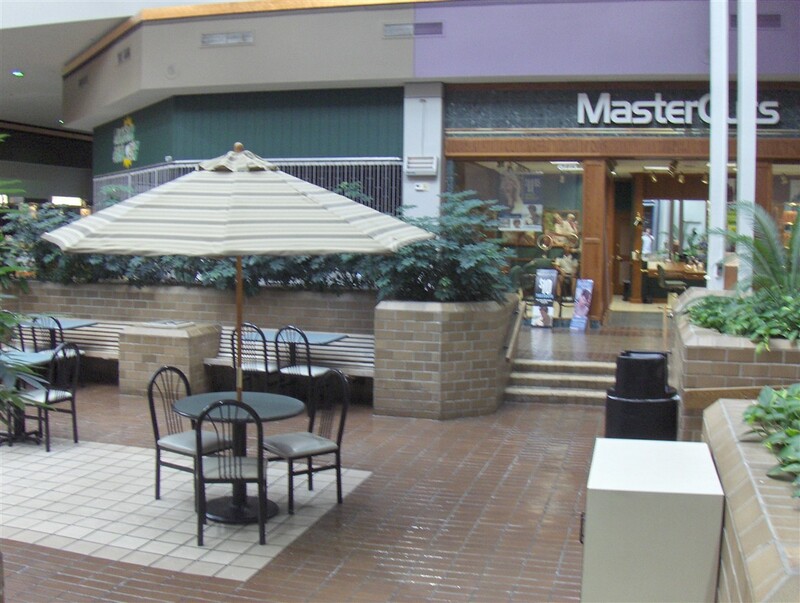 Contact me if you want more information about this mall project. Heritage Park Mall is up for sale again. Now at almost half the price it was purchased for a few years ago. I’m surprised the last 4 tenants can even stay open. Heritage Park is now down to six mall stores and Sears as an anchor. Sears will be there for years to come because of their loyal customer base, they own the store outright and the nearest Sears Stores are 15-30 minutes away. 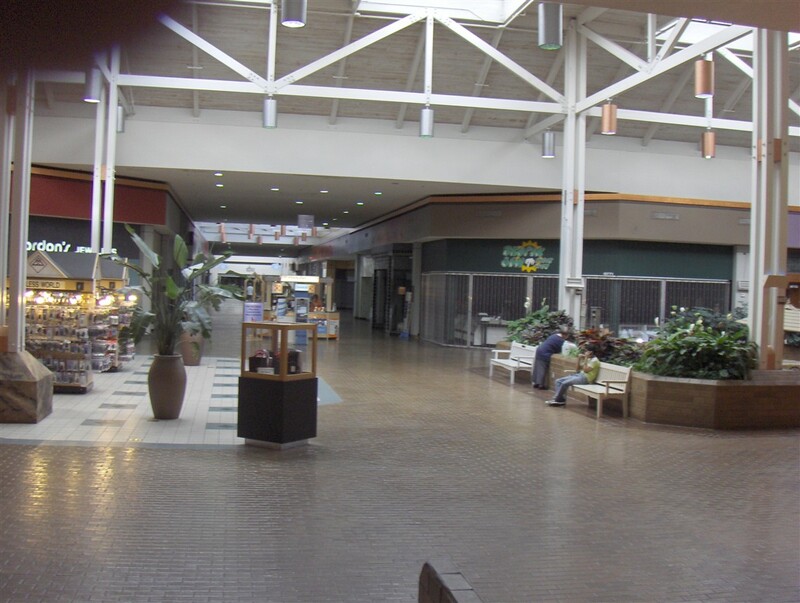 Sometime in 2000 former city manager Charles Johnson wanted to buy out that mall and reform it into a modern “strip mall’ but the owners refused to sell at that time. So other drastic measures were taken, Mr. Johnson worked out a plan that would buy out 80 acres outside Tinker along 29th St that involved in the removal of existing homes and businesses there and transform into Town Center Plaza today. Sadly Mr. Johnson died befor the project was completed. Hint: the old Firestone was the last of the old buildings to go because they had a one hundred year lease on the property. Where Logan’s Road House now sits. I lived there in MWC until July 2009, I relocated my self back to Arizona for a better life. Some of you should take a class in Economics. 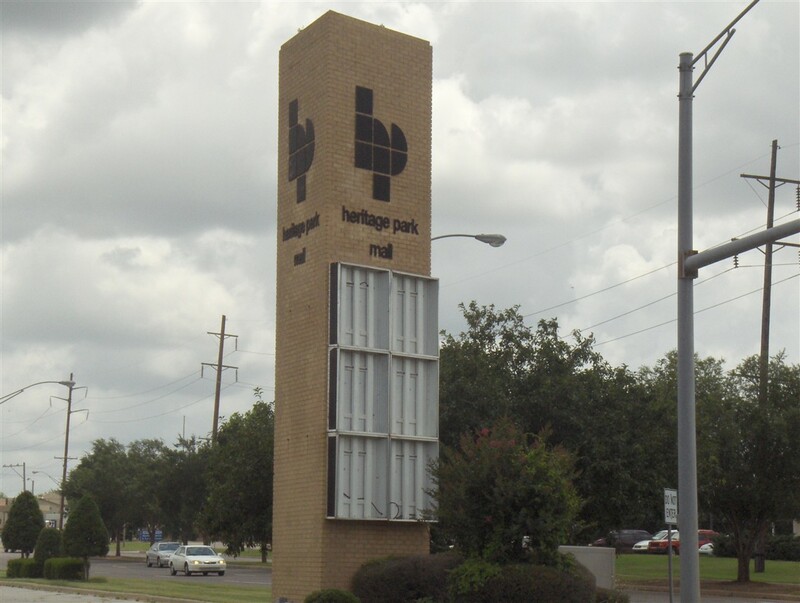 The downfall of Heritage Park Mall can largely be attributed to the success of the Town Center Plaza. Really, the name Plaza is misleading, because it is a mile long mega center of retail and restaurant businesses. It has frontage to I-40, a major transcontinental highway, and directly across from Tinker Air Force Base. Lucky for us Okies that the owners of HP wouldn’t sell. Otherwise, we wouldn’t have the Plaza. And when Walmart cames to town they put most of the major department stores out of business, regarless of geographic location. Now, I’m just waiting on a new movie theater in the area. Any by the way, Firestone managed to keep their lease and have a retail store in the Plaza. Oke. Firestone kept the property because they have a 99 year lease and demanded to be paid for that lease if they were forced out. Heritage was dying long before the Town Center Plaza was even a concept so that has nothing to do with it. Walmart was already here, they were located at Reno and Midwest Blvd, as was Target and Albertsons. The mall died because of mismanagement. Frankly the location was stupid as well. No one in the neighborhood wanted HPM to be located here because of the traffic jams it caused. Well Feburary 15th this mall is closing it’s doors with the exception of Sears. I guess Crossroads is next. I do not like the bg outside malls, I guess I am a dying breed! @David S., I would suggest either a.) e-mailing them to the Labelscar guys (e-mail addresses are here: http://www.labelscar.com/about-labelscarcom-and-its-authors ), or signing up for Flickr and posting them there, or both. @David S., Any chance you could email me those photos? I have some great memmories as a kid / teen there.. I never had any $ but sure loved to mall walk with my friends, and look at stuff we couldn’t afford.. I miss the fountain, I loved throwing pennies in there.. No wishes ever came true though, as I am still not a billionaire.. 😉 I really loved HP. I remember seeing santa and getting pics taken with him there..
Hi Randy–sorry for the delay in my response. I will need to scan the photos first. The photos are pretty “low-key” but they were taken in 1980 (mall’s heyday). I believe many of the photos were taken some morning before the mall even opened (my manager was testing out a new camera). It may not happen till early June (I am a teacher in Tahlequah). I’ve known about Crossroads, Penn Square, Quail Springs and Sooner Malls for decades but had NO idea MWC had its own mall until this year. I noticed when I was at Big Lots store across the street a few months ago. HPM already looked deserted when it got my attention and I was sort of pressed for time to go somewhere, so I left w/ a promise to check it out next time. Which I did, but too late–it’d already closed. As soon as I got home I researched online and learned HPM had closed earlier this year but Sears remained open as it owns its part of the mall. Anyway, when I kept my promise to check it out, I managed to drive around it to see. No cars anywhere except at Sears. The buildings still looked good and decay hadn’t set in yet except for weeds growing in the parking lot. IMO it should be reopened and given another chance. Not w/o renovation, of course. Looks dated from the photos provided here. Thanks for the photos, by the way. Does anyone know what plans there are for the future of the mall, or at least its location? I’m pretty sure 1978 is correct. I was born in 1970 and I definitely remember the construction & opening of Heritage Park Mall. Sears was an independent retailer before the mall attached to it. The west end of the mall has been converted to a Life Church campus. Sears is still open on the east end. The rest of it is empty. Thanks and I would like to see the old place full again and if any one is wondering what happened to the roof above the main entrance, I watched a F1 tornado rip the plywood off of it from the north end of the parking lot. Quite and experience.